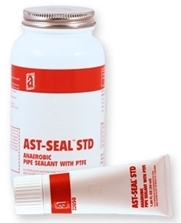 AST-SEAL™ Std (Standard Grade) is a general-purpose pipe sealant providing an instant permanent seal that cures in the absence of air to lock threads securely. Withstands temperatures from -65° to 300°F (-54° to 149°C) continuous, 375°F (191°C) intermittent. Not for oxygen use. Pressure Range: Seals to 1000 psi immediately after application and up to the burst rating of a typical pipe after curing. Will not clog small openings typically found in hydraulic systems.